The building the lodge is in was built in the 1800's, but the lodge was actually formed in 1873. That is carpet you see, and there is some blue in the carpet, it's just hard to see from that picture. The photos on the walls are of Past Masters from the beginning of the lodge. The population of our town is only about 3000, so the size of the lodge is about perfect. There is a fellowship area also that is rather large. A Brother from Peru(I believe that's were he's from) came up a few years back and put together a photo album and website. Great pics of some of the lodges around MS and other places. I am a member of Trinity Lodge #88.
nice pics brother backwoodsgold, in all the pics i have seen what are the rods in the east used for? to me they look like steward rods. Schnider-Can you please contact me regarding your lodgeroom? It has the appearance of what our temple board i trying to acheive. Great looking pics here. Thanks for sharing. I just took a picture of the outside of our building yesterday, but have yet to get some of the inside...will try to get those soon. 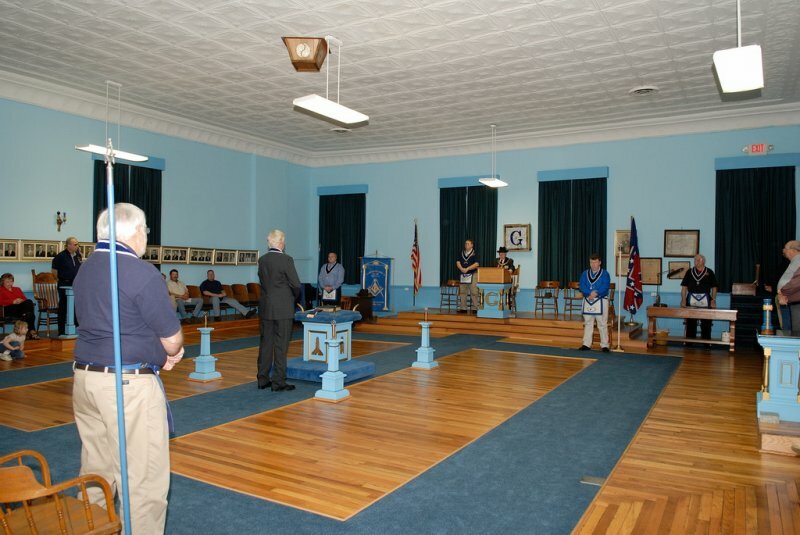 love to see pics of the inside, was it a york rite temple when built or just blue lodges? This is our Lodge in East Liverpool, Ohio. I'm not 100%, but think it was built as a Blue Lodge. I'll find out. Eagle...What a GREAT looking old building! Looks like it has a lot of character. This is the site that Jerry's daughter & I put together. Our Hall Board is no longer keeping it up, so the e-mail address is no longer any good. I still like the pictures. Directly across the street from us, is Sutter's Fort, & across from the Fort on the other side is Pioneer Church. Three historical site's to see together for the traveler. BanditBBQ "Eagle...What a GREAT looking old building! Looks like it has a lot of character." It really does. We just had our 150 year reconsecrate with Ohio Grand Master Charles R. Murphy. There is 4 floors and a basement but the woodwork in this building is so beautiful. There is a ton of history that goes with it. Thank You Brother. May we always meet on the level! BanditBBQ, Your Lodge looks New! Very nice. She really looks good Brother. Heh...that's a common misconception because of the name. Naval Lodge started out in 1855 to serve the Masons at Mare Island Naval Shipyards - actual Navy personnel - but has long since been inclusive of everyone else. I don't believe there is a single man active in the military within the lodge, though we've got plenty of retirees and others who have served. I've got to get some pictures up on the forum of the lodge itself. The current building was built in 1973 and it shows in design, but it's still impressive and has a fantastic view as it sits at the top of a hill. Thanks. I really need to learn more about the building itself, but believe it was built in the 1930's. When I'm able to get in there and get some more pictures, I'll try to find out more. I'm working on a website for the lodge as well. The 'working' site is online at http://www.gosalem.com/freemason - http://www.gosalem.com/freemason ...I'm doing it without very much direction, so am definitely open to ideas. Hmmm, Yes the name got me as well. Looking forward to seeing some of the pictures of the Lodge. Here is a picture of our Lodge room. You can not see the balcony behind me! I too need to get new pictures with the balcony. Take care Brother. Good Job Brother. I too am the web master of our Lodge web page. Our link is http://riddlelodge.webng.com/index.htm - http://riddlelodge.webng.com/index.htm I have been keeping up with it sense February I believe, the old site had not been touched sense 2004! I like the new look much better now. Everything I have seen on your web page looks good, I see some of your links are offline but you did say " working site " so I think you are doing great. Take care Brother and keep up the good work! Thanks for checking the site out. We've never had a website for the lodge...this is simply a working site until we get it where it needs to be with information. Other than passing the address on to a couple of brothers in the lodge, this forum is the only place I've listed the temp site. You seem to have some really good links on your site, though with the slower connection I have here at work, I wasn't able to pull up the pages. I'll have to check the site out when I get home. I look at as many Masonic sites as I can. Still seeking light! If there is any information you still need let me know I just may be able to help. If I can I will. If you can use any of my links please feel free to use what ever you can. Thank for looking at Riddle Lodge #315 web page. Though I don't have any new pics as of yet, I did want to let you know that the website is coming along nicely and is far enough along that the Grand Lodge of Illinois has approved it for listing on their website...another step closer to growth! I am very open to ideas, suggestions, comments and nods if you'd like to take a moment to check out the new site. It's still a work in progress, but MUCH further along than a couple of weeks ago. 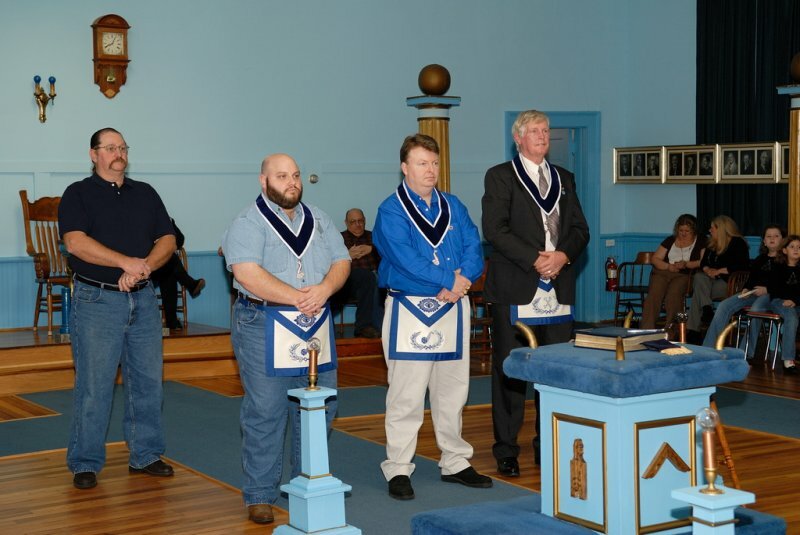 Online @ http://www.gosalem.com/freemasons - http://www.gosalem.com/freemasons . I like it. You have done a very good job on it and it shows. The last time I looked at it the links did not work, now almost all of them do! Great job. Thanks Eagle-751! It's been a lot of fun to work on, and still have a couple of pages I'm working on for the Shrine Club too...those will be unveiled in due time. Your page does look good, keep up the good work, I know you Lodge appreciates it! Eagle, your site looks good...very informative. I've been through East Liverpool. It's been a few years, but I have friends in both Lisbon and Salem, and used to get out there several times a year. Pretty area. What a small world.... Next time you are in this way you will have to call and we can hook up. If you are lucky enough to be on the first or second Tuesday we can go to the Lodge. If you plan on coming PM me for my phone #. I pass Lisbon and Salem to go to work everyday. Now the last time I was in Texas it was in 95 in Corpus Cristi. My first Navy ship is now a museum there, the http://www.usslexington.com/ - U.S.S. Lexington AVT-16 I was stationed on Her for almost 6 years in Pensacola, Fl. Have a good one and let me know if you pass this way. Yes, we do......we got with the times....and our lights are "environmentally friendly"
What a small world...Have a good one and let me know if you pass this way. Though I don't have any plans for the near future, I will DEFINITELY let you know! Thanks! We use lights that flicker like candles. The filiment in each bulb is the Masonic logo. I'd love to have a projector tv, or big screen, in our Lodge...pretty nifty! We have the lights but we took a vote, and it was voted that we go back to candles. Didn't see you in the pics........a little shy? I'm sure Max will reply about the cars. Oh I'm just so shy (lol). I'm the one taking the snaps. That is my tall guy looking at the black beauty. I should have taken more snaps of the cars, they lined both sides of the street for three blocks. It was also the third car show we saw on the trip. Everyone was out driving the coast Hwy in their pride and joy. The 5th snap down was taken from our hotel room. I like the lodges Masonic Dogs set up you can take it anywhere. First, our Masonic temple that was in use from 1902 until 1968 "when it became another victim of urban renewal." Hard to see in this picture, but that's a Scottish Rite eagle at the very top. Our current Masonic temple/center. The stone out front is from the old temple. If anyone is interested in seeing more detailed pics of the old temple, you can go http://www.glnd.org/FGO/FGO_PDF.pdf - here . Some of the history can be found http://www.fargo-history.com/other/mason.htm - here . I don't currently have any pictures of inside, but I will post some once I do. On a side note, I just visited the Grand Lodge of Japan and took some pictures there, so I'll post those in an appropriate thread later. Grand Lodge of Japan .....? WOW! What an impressive Lodge! New member of the forum today. In Coldwater we have the candles. I hope I can get a few pics up for viewing. It is an old lodge building that was a museum back in 1860 to 1885. 1961 Healy is fine auto. like to see some pics healy. We have finally updated our site with a new address. http://www.MarionLodge130.com - http://www.MarionLodge130.com . Now to just get more pictures online! It's called "bodock" (two syllables). Some folks call it a horseapple tree. Bodock comes from the French "bois d'arc". Its kinda orange(ish) when fresh, turns a beautiful burned-copper when dry and varnished. 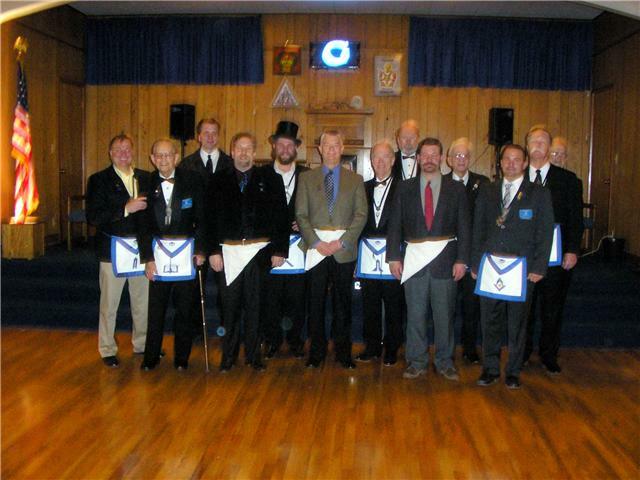 http://www.pontotoclodge81.org" rel="nofollow - Pontotoc Lodge #81 F.&A.M. Here's the interior of Pontotoc Lodge #81 in Mississippi. Camera is facing East. Gotta love that orange carpet! !